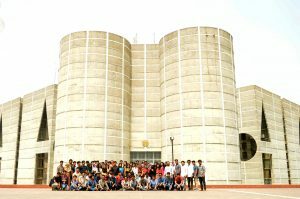 Students visit the Master Piece of Louis I. Kahn On 18th March, 2018, a group of hundred students visited the National Parliament Building of the People’s Republic of Bangladesh. This visit is a regular annual field trip organized by the Department of Architecture, State University of Bangladesh to help strengthen the body of knowledge as well as interpretation of built space by the master of light in space. Accompanied by the faculty tutors the students spent some quality time inside and outside the parliament house premise.